Another of the popular HeartStrings Faroese shaped shawls, this time in an allover stockinette stitch lace version. The pattern begins with the center back neckband, then proceeds from the neck down in charming lace silhouetted heart motifs. 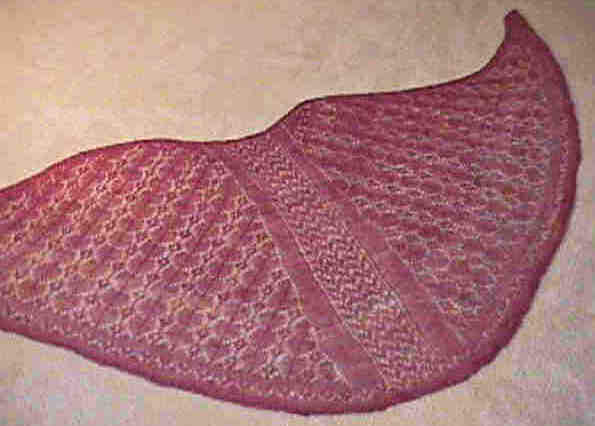 Yarn over increases and the lace patterns themselves are used to shape the traditional center back panel, side panels, front bands, and fitted shoulders. This design adds a band of garter stitch at each side of the center back panel, giving further definition to the graceful lines of this shawl. Easily adjusts to other sizes by knitting to length desired, and other weights of yarn with corresponding adjustment in needle size and yardage.